​Welcome to Zombie Squirts! These adorable little zombie kids help children understand why it's important to accept differences and why not to bully. Reading children's books with your kids is an excellent way to open up the difficult discussions about bullying and the effects it causes. The brilliant pages and vibrant, not-so-scary zombie characters keep kids engaged as well as learn valuable lessons they're able to understand. There's also a fun activity throughout each story book the whole family can enjoy! Make the "Bully Talk" beneficial and FUN for you and your kids by bringing the Zombie Squirts children's books into your homes and their anti-bullying messages into your hearts! 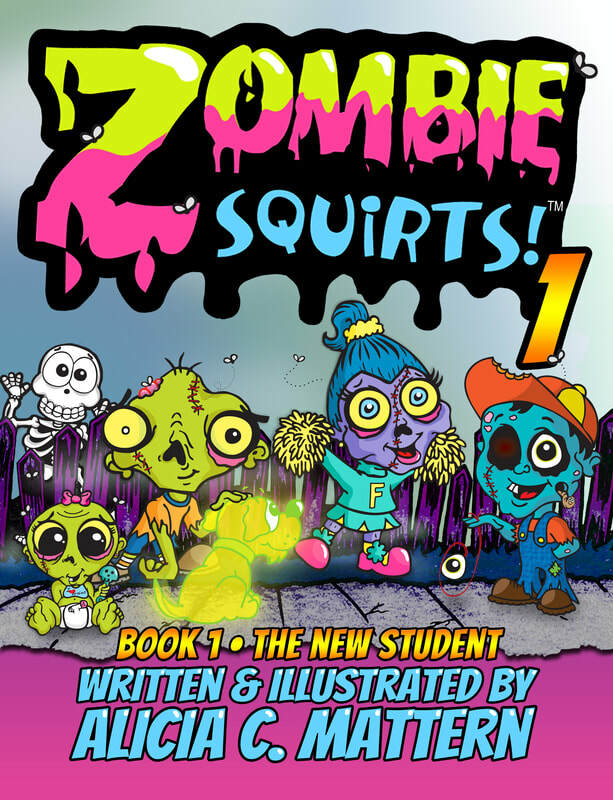 Meet the Zombie Squirts gang as they reunite for their first day back at school. Their wacky 'ol teacher, Mr. Snell, announces the arrival of a new student named Annie Palmer. The Zombie Squirts are quick to welcome her into the group and come to her rescue when the other zombie kids laugh at her for being different. From a yo-yo eyeball to pom-pom hands, the Zombie Squirts explain how everyone is special in their own zombie way. Captain Crawly, the pirate spider, also has a fun activity for all to join! Look for him throughout the pages as your friends and family read the Zombie Squirts' positive anti-bullying message again and again. 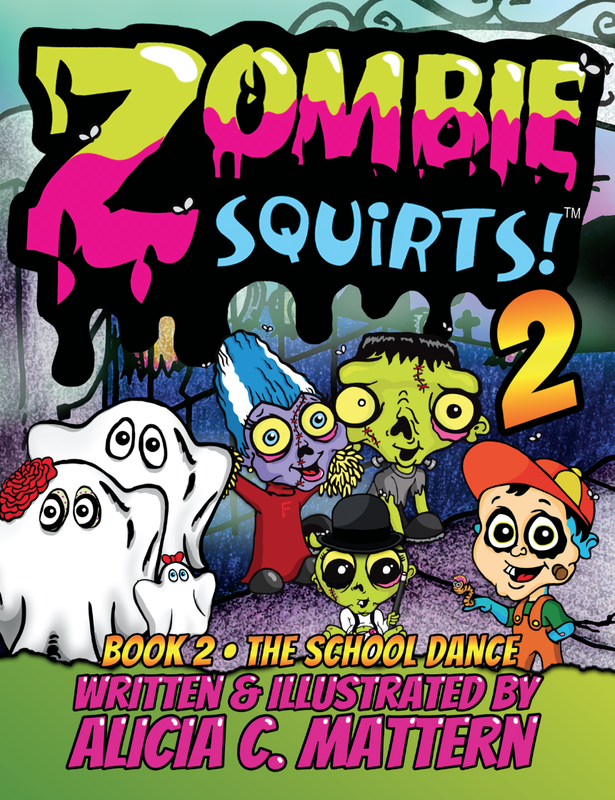 The Zombie Squirts gang can't wait to show off their costumes at the school dance! And Buddy has a special surprise to show everyone! However, Buddy is crushed when a high school bully, Cyber Sawyer, teases his surprise by posting it to the school website for all to see. The new girl, Annie, immediately comes to her friend's rescue by getting to the bottom of Cyber Sawyer's behavior... only to find out he, too, was a target of bullying growing up. Captain Crawly, the pirate spider, is at it again with all new hiding places! So don't forget to look for him throughout the pages as you read the second installment of the Zombie Squirts' anti-bullying series. Over 50 PAGES of FUN with your favorite anti-bullying zombie kids! 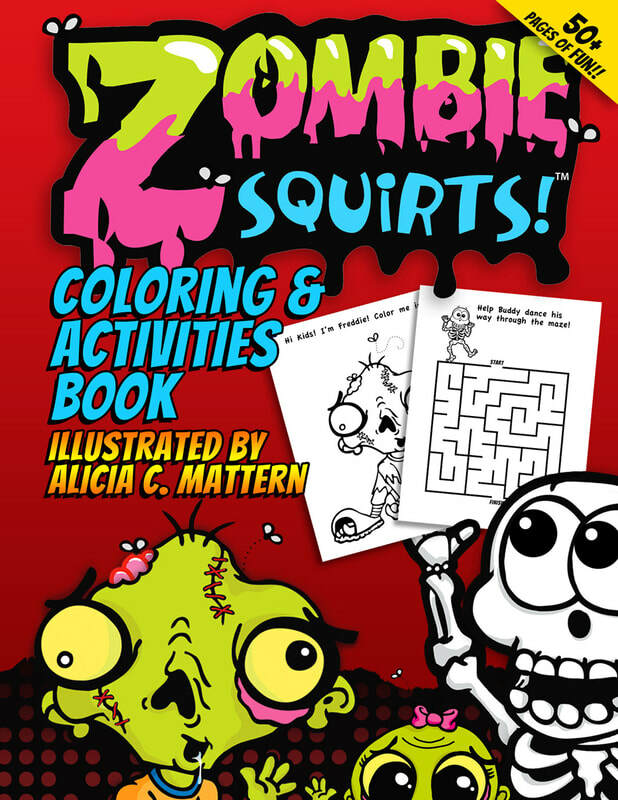 This time, join the Zombie Squirts gang in this educative activity book featuring puzzles, matching games, drawing, coloring and more! Another fun way to get the anti-bullying discussion started with younger kids! Get ALL THREE Zombie Squirts books PLUS a BONUS book, Timmy the Fish, Autographed and Personalized for only $60 + FREE SHIPPING within USA! Fill out the contact form below to place an order. ​Payment options are PayPal, Venmo or CashApp. Looking for Bullying Tips and Resources? Check out our BLOG for anti-bullying tips and tools plus much more! We also have a YouTube Channel dedicated to helping kids AND parents, everywhere. Click below to subscribe! We're not just here to sell adorable zombie children's books... we're here to help bullied youth and put an end to the BULLYING EPIDEMIC! Don't Wait...Talk to your kids about bullying! Most people remember getting bullied at some point in their childhood. It could have been the scary girl at the back of the school bus who kept threatening to beat you up, or it could have been a gang of jocks who kept stuffing you in the locker during middle school. ​​They used their words, their fists, or sometimes both. Kids can be mean to each other for a lot of reasons, or sometimes seemingly no reason at all. Either way, it’s a relief to leave that period of our life behind, usually around the time we leave high school and go to college. Sure, people can be mean to you in college, but you usually have more options for avoiding them at that level. When we have kids, though, we start seeing bullying through a completely different set of eyes, and the pain can be visceral. ​It’s hard to know what to say to a kid who comes from school upset every day, but you have to say something. Think about your childhood bullying experiences. Did your parents tell you things like “Oh, she’s just jealous?” If so, was that a very helpful thing to hear? Probably not. Looking back, maybe the girl who called you “barfbreath” was jealous of something, but maybe she wasn’t. It can be really hard to know, and even if you’re 100 percent sure about someone’s motivation, it doesn’t mean you’re any closer to solving the problem. Be especially careful with your daughters. If a boy is throwing dirt in her face or pulling on her pigtails, don’t tell her “That just means he likes you.” Maybe some boys are trying to show affection that way, but you don’t want your daughter to associate mean, cruel behavior with love. ​​You don’t want your son to do that either, but it seems like boys are given a pass for this behavior more often than girls. If someone is trying to flirt with you, they can tease you, but it shouldn’t be done in a hostile or abusive manner. You probably wouldn’t tell a 30-year-old woman that her boyfriend’s uncontrollable jealousy “is only because he cares,” so don’t tell a 10-year-old girl that either. Movies, music, TV, and books can show us a lot about who we are, as well as who we’d like to be. For example, the Pixar movie “Inside Out” resonated strongly with a lot of depression sufferers because there was literally a character called Sadness. We feel less alone when we see characters dealing with the same stuff we encounter in our everyday lives. So if your child is dealing with persistent bullying, consider investing in some anti-bullying books for kids. You can read the books together and talk about the message behind them. Kids ask a lot of questions. It’s their trademark. Some questions are easy to answer, like “Why do I have to go to the dentist?” Questions about things like bullies and divorce and death are harder to answer. The good news is that your child probably isn’t expecting perfect answers. Engage with the topics in a way that’s both age-appropriate and honest, and you’ll be doing a lot better than most parents.